Time is money. 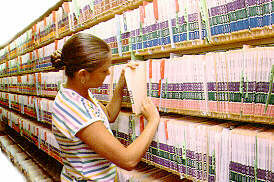 GBS can save you both with its complete line of standard and customized filing products. GBS offers a wide variety of folder sizes, expansions, colors, and stock weights to insure that you get the product that's best for you. 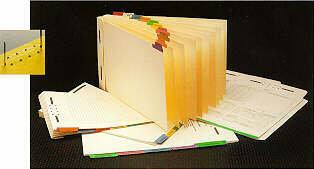 GBS has filing products designed to streamline your system. GBS turns paperwork into paper that works! Whether you file by letter or by number, GBS color coding systems will bring you efficient, productive control of your files. Without GBS color coding, the only way to uncover a misfile is by fumble thumbing through the complete file until the misfile is stumbled upon. In a GBS color coded file, the system makes misfiles unlikely. When they do occur, the out of sequence color is self-incriminating. For more information click here. 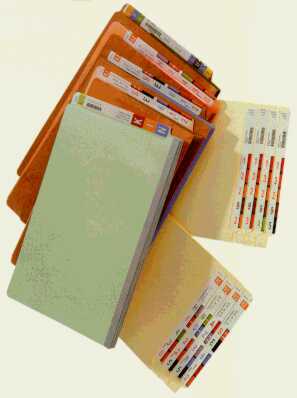 Colorflex is the unique one-piece, computer generated file folder label that attaches to top or end-tab folders and pockets. Colorflex instantly provides your organization with files that are color coded (alpha and/or numeric) and bar coded for fast, accurate filing at all times. Colorflex can be provided in a variety of color schemes and label sizes (1/2" up to 2") to match almost any existing system. You can also develop a color system unique to your specific filing needs. The Colorflex strip label can be produced from your data base of information including account names, numbers, year codes, etc. Simply transfer your data to magnetic media, send it to Colorflex and we will produce a finished, customized label. Allows you to print your own strip labels on demand. InPrint gives you the capability to include color bands, bar codes, corporate logos, lines of text, and much more! Output is six labels per page - up to 720 per hour. System includes hardware, software, supplies, and 2 custom label designs with unlimited additional customer designs optionally available. Low-end, low-volume version of InPrint. 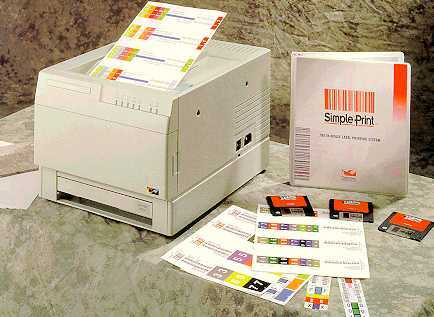 SimplePrint gives you the capability to include color bands, bar codes, corporate logos, lines of text, and much more! System includes hardware, software, and 1 custom label design. SimplePrint can be upgraded to InPrint to grow with your needs. Allows simple and efficient strip label application--up to 400 strip labels an hour! The applicator adjusts to accommodate almost any size folder (letter, legal, x-ray jacket, expandable pockets, etc.) including top-tab and side-tab. Our Custom Index Tabs add a new dimension to just about any publication, document or resource material. For use with anything from sales documents to manuals and textbooks, these attractive and functional Index Tabs make specific information more readily available to anyone who uses them. The perfect addition to pressguard folders, our Custom Filebacks allow you to transform common folders into a sophisticated and complete filing system. Whether you prefer them in loose leaf form or taped permanently into the folders, our filebacks are available in a virtually limitless variety of custom titles and colors...enabling you to design a filing system that's just right for you! 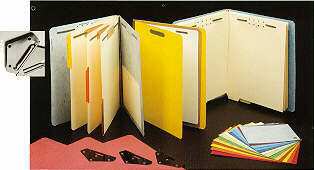 Our Custom Folders are the perfect choice for use as classifiers, expansion folders and covers. Available in a full spectrum of colors...they can be manufactured according to letter, legal or any other size requirement. They can also be made with divider tabs or filebacks...the choice is yours! * GENUINE PRESSBOARD®, PRESS-GUARD® and GUIDEX® ARE REGISTERED TRADEMARKS OF FIBERMARK, INC., BRATTLEBORO, VERMONT.